Updates on 20 July 2018. There will be quite a lot of cloud around tonight, with showery rain pushing in from the north-west. The showery rain could be heavy at times with a light westerly breeze. It's going to be a rather cloudy start to Saturday with some showers around. It's then expected to become a mainly dry and fine day with long spells of sunshine breaking through. A nest of Asian hornets that was found at L'Islet has been removed. The nest was confirmed as belonging to the bee killing insect on 11 July, and is now being studied. The nest - which is the size of a small football - was found in a garden shed. It was found just 250m and 750m away from sightings of lone hornets earlier this year. Islanders shouldn't attempt to approach dolphins in Guernsey waters according to the president of the animal shelter. Dr John Knight, from the GSPCA, was commenting on reports of dolphins regularly being spotted in Guernsey waters. He said it's rare that they attack humans but is urging people in Guernsey not to take the risk. They will kill each other quite happily if they are competing for females - males will attack others. And if things go wrong they may attack people - it's fairly rare but if they feel under pressure or something like that then speed and headbutting in water can break ribs. It's not something that you want to encourage." An airline in Guernsey has said it will cut down its winter schedule after the government's decision to remove air licensing in the island. The "open skies" policy was passed by the States of Guernsey by 22 votes to 14. 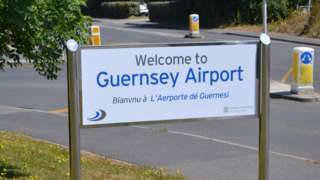 It means that operators will no longer have to obtain a licence to fly in or out of Guernsey Airport, as the government tries to increase competition in the industry. Chairman Derek Coates said the "regrettable unintended consequences" of the "open skies" decision meant they would operate under "Plan B". Quote Message: It is with deep regret as an Island airline, that part of this refocus will inevitably be the removal of all of the non-profitable off-peak flights in the winter months, that used to lose us money. Passengers will in future have no alternative but to pay higher fares on the available seats that remain unsold on our revised winter schedule to help fill the empty seats on our aircraft. It is with deep regret as an Island airline, that part of this refocus will inevitably be the removal of all of the non-profitable off-peak flights in the winter months, that used to lose us money. Passengers will in future have no alternative but to pay higher fares on the available seats that remain unsold on our revised winter schedule to help fill the empty seats on our aircraft. We will now be able to use the resulting aircraft availability to focus on the more profitable routes of our network, thereby maintaining our own business viability. We apologise to the people of Guernsey that we will now be compelled to make these changes." Guernsey's airline industry has been deregulated after a new policy was agreed by local government. An additional Guernsey politician serve on the board responsible for government-owned trading companies such as Guernsey Post, Aurigny and Guernsey Electricity. The States Trading Supervisory Board will now consist of three States members and two non-voting non-political members. The nest is on private property near St Peter's Church, in an area described by the States as "difficult to reach". The authorities are hoping to treat and remove the nest next week. The Jersey community is this weekend being called on to try to help save the lives of two Islanders – and potentially others around the world in the process – by supporting two events planned to get people to sign up as stem cell donors. Guernsey will "work with Ofsted" to develop an inspection framework and not "take their approach wholesale" according to Guernsey's education committee president. Deputy Matt Fallaize was responding to concerns raised by teaching union NASUWT into the appointment of Ofsted as the Guernsey school inspectors from September 2019. He said the decision to appoint Ofsted came after "considerable research and discussion" including informing head teachers of the plans. A sharp rise in the cost of fuel and travel fares has pushed up inflation to its highest level in Jersey for six years according to government figures. The latest retail price index (RPI) figures show inflation is currently 4.5%, an increase of 1.5% since March. The biggest increases were for fuel, lighting and travel, which went up by more than 8% in the year to June 2018. Household and leisure services and the cost of motoring were up. Food and alcohol were up by not as much and the cost of clothes got cheaper. Inflation is still lower than it was 10 years ago when it peaked at 6.4% at the height of the financial crisis. A Guernsey business body says the States should consider removing landing fees at the airport over the winter months to encourage more airlines to operate. The Guernsey International Business Association (GIBA) welcomed the States move to introduce an open skies policy at the airport. Chairman David Oxburgh said the main local airline operators have committed to pass on any reduction in landing charges to passengers, so the States should make this possible as a trial from October. The States is yet to comment. St Clements Road will be closed for three weeks from Samares Manor and Rue de Samares from Monday for resurfacing. There will be changes to the 1A bus service which will divert to the coast road. The island's under-15 footballers beat teams from Sweden, Norway, Brazil, Australia and England before losing out 5-1 to Swedish team Kinna IF. They reached the last 16 alongside teams from France, Italy, Iceland, Germany and Spain. They scored 29 goals during the tournament and only conceded seven. Video caption: Guernsey's consolation goal in their 5-1 defeat after reaching the top 16 from 195 teams.Guernsey's consolation goal in their 5-1 defeat after reaching the top 16 from 195 teams. A special wreath laying ceremony marked the end of a unique visit to Guernsey by a group of German and British soldiers. The cost of living in Jersey has gone up by 4.5% this year, the highest increase in six years according to the States of Jersey. The Retail Price Index (RPI) measures the average cost increases in every day items including food, fuel and housing. The Jersey figure for the year up to June 2018 is two percentage points higher than other parts of the British Isles. The States put this down in part to higher costs in household services, motoring and fuel. Low cost airline EasyJet has been "lukewarm" in its response to the States vote to open up the majority of air routes and and from Guernsey to competition. The airline says flying to Guernsey would be challenging but it will keep the option under review. Guernsey's government has voted to deregulate the airline industry, adopting an "open skies" approach. Independent air taxi service Waves is more positive to the news. It says a "quasi open skies policy" is a step forward for the island and will consider new routes and opportunities for its client base. Government-owned airline Aurigny says it is "sceptical" that open skies will increase connectivity. It welcomed the news the Gatwick and Alderney routes would not be opened to competition. Cancelled operations cost Jersey's hospital nearly £500,000 in the first three months of this year according to government figures. The island's Health Department says nearly two thirds of all cancellations were made by patients themselves. GP Dr Nigel Minihane says while these cancelled procedures add to existing pressures on the hospital, the service itself has to share some of the blame. Video caption: Jersey GP says more work needs to be done to improve communication over cancellations.Jersey GP says more work needs to be done to improve communication over cancellations. A report used by the States of Jersey Police investigating the death of a young child two years ago has criticised the original layout of a road at the Millennium Park in St Helier. Three-year-old Clinton Pringle was hit by a vehicle driven by Rebekah Le Gal as he crossed a road shared by pedestrians and vehicles. She was convicted of causing death by careless driving. The report by a specialist in road safety highlights how some problems weren't picked up in safety checks carried out when it was built. The Parish of St Helier says it's reduced the risk to pedestrians and cyclists around Millennium Park and has since held a full safety assessment of the area and put in changes to make the road layout safer. Guernsey's Under 15 footballers are out of the Gothia Cup following a five one loss to a side from Sweden. The Sarnians reached the last eight of the tournament with 195 teams having entered from 38 different countries. On their way to the quarter finals, Guernsey beat sides from Brazil, Norway, Australia and England. The tournament organisers paid tribute to the island side, saying on Instagram: "The boys of Guernsey Schools are a perfect example of how to exit a tournament with pride." The rate of inflation in Guernsey was 2.4% if you exclude mortgage interest payment (RPIX) and 2.6% if it is included (RPI). The Guernsey government figures cover the year up to the end of June 2018 and are based on the price changes of "shopping basket items". The rate of increase excluding mortgage interest is down from 2.8% in June 2017 to 2.4%. However if you include mortgage payments it is up from 2.3% to 2.6%.